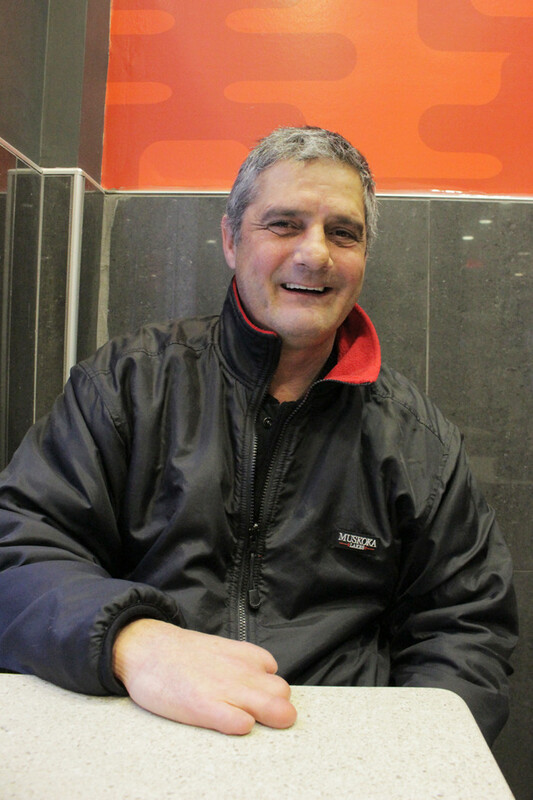 In a McDonald’s restaurant near Berri-UQAM metro, Frank Sthilaire waits patiently at the counter for his coffee—two creams, one sugar. He recognizes a homeless man sitting at a nearby table, and walks over to say hello. As he lifts up his head and recognizes Frank, the man’s face lights up with a warm, radiant smile. This sight isn’t rare. Frank spent 14 years living in the street, and he knows just about everyone still experiencing that hardship. 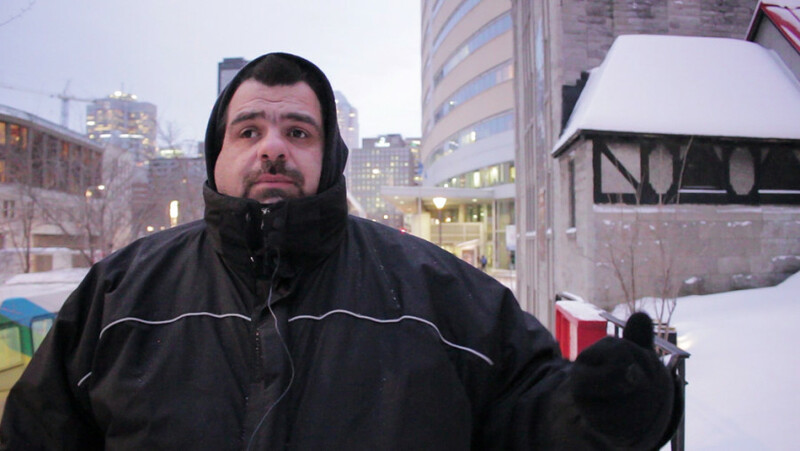 Now living in his own apartment, Frank spends his days walking the streets of downtown Montreal, handing out sandwiches, gloves and whatever else he can to help the city’s homeless. “It’s going to be cold as hell tonight—are you coming to the ‘red roof’ tonight?” Frank asks. He’s referring to the St. Michael’s Mission, one of the city’s two new emergency warming stations for nights of extreme cold, distinguished by its red metallic roof. Frank gives the man directions, and explains that he’ll be able to stay warm indoors overnight, with soup and donuts being provided. They’ll even try to find him a new pair of boots. The homeless man can’t contain himself; he hugs Frank in gratitude, and when he pulls away, tears are seen swelling up in his eyes. Frank tells him not to cry. He knows how important the warming stations are—from experience. Last February, when he was still sleeping in the street, one of Frank’s hands slipped out of its glove, quickly causing a severe case of frostbite. When he was brought to the hospital, the doctors did what they could to help, but it was too late. They had to amputate most of Frank’s fingers. Frank Sthilaire’s had incisions between what was left of his fingers to increase circulation and improve hand mobility. The reality faced by Montreal’s homeless in the winter months is a dangerous one, and now, homeless advocacy groups are ramping up the pressure on city hall to ensure that Frank’s experience isn’t shared by others on the street. With this mission in mind, representatives from SOS Itinérance and Solidarité dans la rue met with Montreal Mayor Denis Coderre at city hall on Tuesday, hoping to improve the resources being offered to the homeless on nights of extreme cold. Among them was Alexandre Paradis, founder of SOS Itinérance—a man who spent time living on the street, and knows the dangers of freezing temperatures firsthand. He says that a top priority for the city should be to improve coordination between Montreal’s two warming stations—St. Michael’s Mission in Ville-Marie, and l’Anonyme in Hochelaga-Maisonneuve. The call for an independent coordinator comes in the wake of an error that led to the St. Michael’s Mission not opening its doors on the night of Jan. 4. Paradis says he contacted the station’s director, George Green, throughout the day to verify if it would be open to the homeless overnight. The weather forecast called for a wind chill temperature of around -28 C, and the warming stations were instructed by the city to open in the event of a forecast of -27 C or lower. The Link made several attempts to contact St. Michael’s mission for comment, but the station could not be reached before press time. In addition to better coordination, Paradis also lobbied the mayor to bring the warming stations’ temperature threshold up to -15 C—a request backed up by a Change.org petition with the support of 3,429 people. The city’s original standard of -27 C was based on advice from Montreal’s Director of Public Health, who affirmed that the danger posed by the winter cold increases sharply at that temperature. This conclusion is echoed by Environment Canada, which states that “exposed skin can freeze in 10 to 30 minutes” in temperatures ranging from -28 C to -39 C.
While the city would not commit to -15 C, a representative from the mayor’s cabinet did point out to The Link that “the mayor … increased the temperature to -20 C out of compassion” in the week prior to the meeting. According to Paradis, mayor Coderre indicated that he was open to further discussions about the temperature threshold in the future. The parties also discussed ways in which the city could better inform its homeless population on the location and availability of the warming stations. As Frank walks out of the McDonald’s into the frigid late-afternoon air, he looks on as the sun begins to descend on the streets of Montreal. He takes a deep breath, and smiles broadly at having found the homeless man inside and telling him about St. Michael’s. For all he knows, he just saved that man’s life.